Li Na of China returns a shot against Daniela Hantuchova of Slovakia on Day 1 of the 2012 Olympic Games at the All England Lawn Tennis and Croquet Club in Wimbledon, in London. Li Na, the two-time Grand Slam champion who on Friday announced her retirement, was the greatest Asian tennis player of all time. She was much more than that, too: At her best, she was as dominant as any of her peers, and she kept improving as she got older. “I’ve succeeded on the global stage in a sport that a few years ago was in its infancy in China,” Li wrote on her Facebook page. Li, the first Asian-born man or woman to reach, let alone win, a Grand Slam singles final, is right. Heading into the 1999 U.S. Open, when Li was 17 years old and ranked outside the top 300, China could boast only 0.55 percent of ranked players on the WTA Tour and just 0.35 percent of all singles ranking points, according to data I compiled this month with the help of colleagues Paul Schreiber and Andrew Flowers. 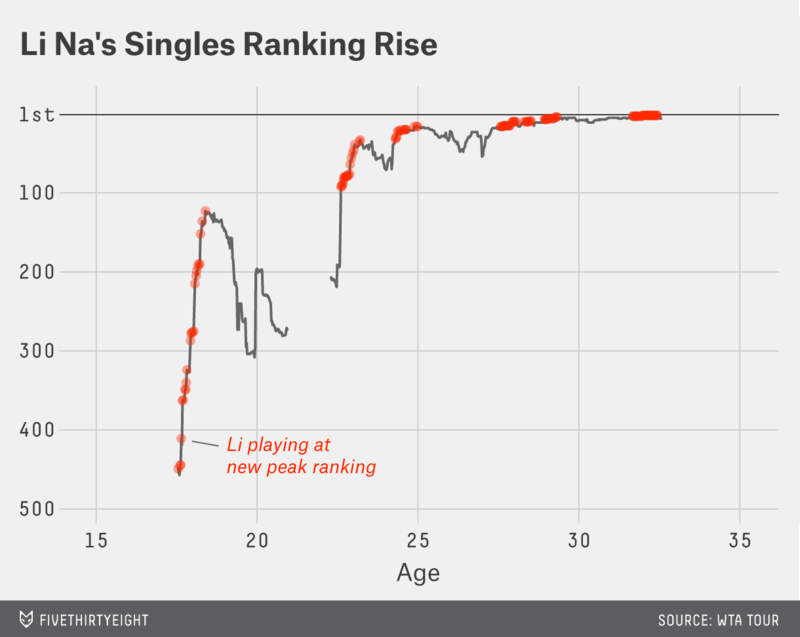 Heading into this year’s U.S. Open, which ended early this month, China had 3.5 percent of ranked players and 5 percent of singles ranking points. 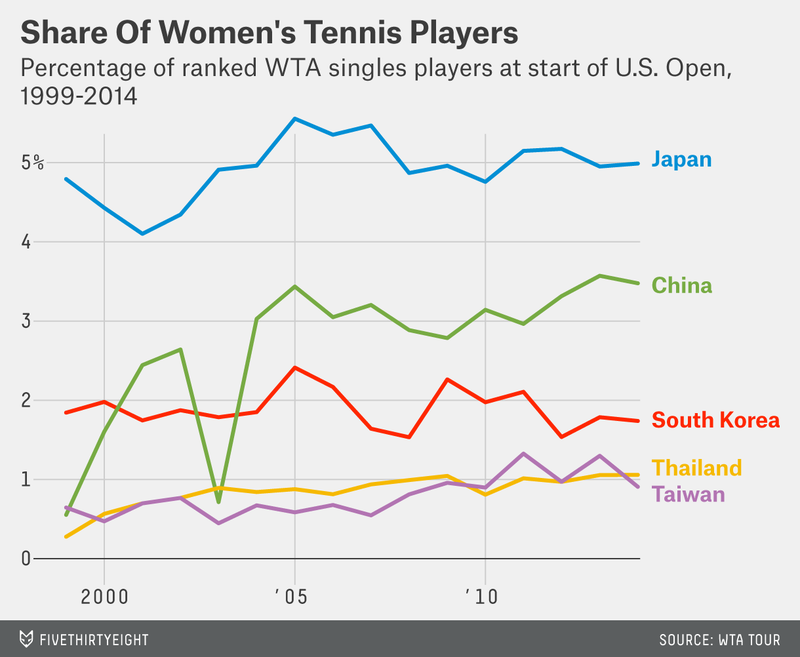 The rise of China as a women’s tennis power coincided with, but also surpassed, the rise of women’s tennis elsewhere in Asia. Even on a tour led by No. 1 Serena Williams, who is five months older than Li, Li stood out for her ability to keep improving. She took two years off from pro tennis starting in 2002, a period during which she began studies toward a journalism degree she earned in 2009. Li cracked the top 100 at age 22, the top 20 at age 24, the top 10 just before her 28th birthday and the top five at age 29. Although Li struggled with knee problems during her last years on tour, she also kept improving, fine-tuning her serve and net game while working with coach Carlos Rodriguez. Her ranking showed it: Li played nearly all of her last nine months as an active player at a career-high ranking, first reaching No. 3 last fall, then the No. 2 ranking early this year, after winning the Australian Open. 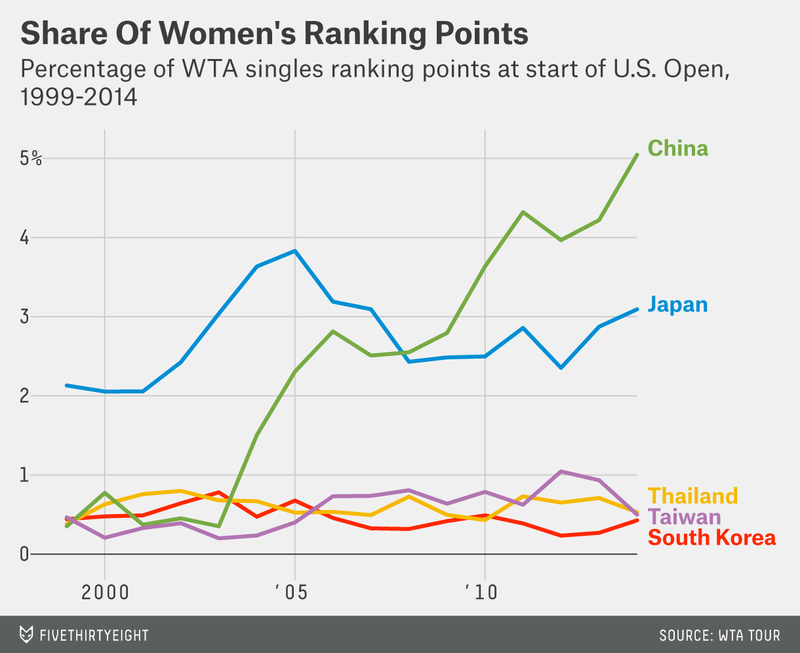 At that Australian Open, Li — sometimes inconsistent during her career — reached total dominance. She won four sets by the most dominant possible score of 6-0, including two against Top 25 opponents in the fourth round and the final. Williams, a winner of 18 Grand Slam singles titles, won four bagel sets at the same major tournament just twice in her career. Among the stars Li bageled at Grand Slams were two Grand Slam champions and four other major finalists. Although she never reached the No. 1 ranking, Li’s bagel rate establishes just how good she was when she was dominant: really, really good. She averaged 18 bagel sets won for every 100 Grand Slam matches played, just behind Williams’s rate. Li is ahead of four of the eight other two-time Grand Slam winners over the past decade in bagels sets won per Grand Slam match.